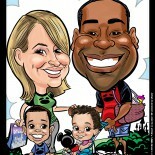 We hadn’t had such a fun, calming Sunday afternoon in a while. 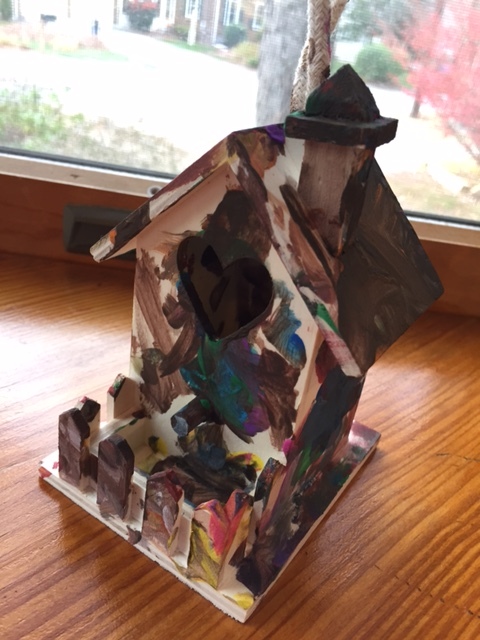 My husband took the kids to Michael’s, and they each picked out birdhouses and some paint. 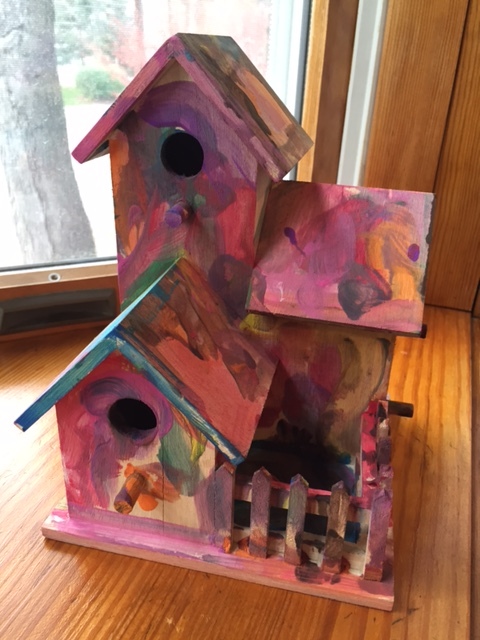 The Superhero chose a bird mini mansion, while Sweet Pea opted for the bird condo with a heart-shaped door. Superhero’s creative vision has seen dramatic improvement since starting kindergarten. Sweet Pea got really close to hers, concentrating on each stroke. Her fine motor skills are really coming along, and I am continually amazed at her attention span when it comes to art. But at the age of two, she hasn’t mastered the idea of rinsing colors off the brush before switching, so most of hers wound up being brown. While their masterpieces were drying, we enjoyed a family dinner together, which is rare, since my husband is usually at work during this time. After the munchkins had their showers and bath, we turned on Peppa Pig to complete the wind down to bedtime. Exhausted, I laid down on the couch. Sweet Pea climbed up and gently nestled herself against me in the spooning position, saying she wanted to cuddle. Few moments are as sweet and heartwarming as this. I wrapped my arm around her tiny waist and nuzzled my face into her hair, which was still a little damp from her bath. I was as content as I’d ever been. I must have dozed off. Suddenly, I jolted awake to the sound of a crack, excruciating pain, and blood gushing out of my nose. It took a minute to register what happened as I ran to the bathroom screaming. But apparently, Sweet Pea got excited or quickly tried to get up. In so doing, she blasted the back of her head against the bridge of my nose. Totally an accident. But totally freakin’ painful. I cried my eyes out for a good 10 minutes, as I sopped up blood with wads of tissue. Superhero asked repeatedly if I was okay, and promised to get me one of his stuffed animals to sleep with to help ease the pain. The bleeding subsided and my husband got me an ice pack and some ibuprofen. 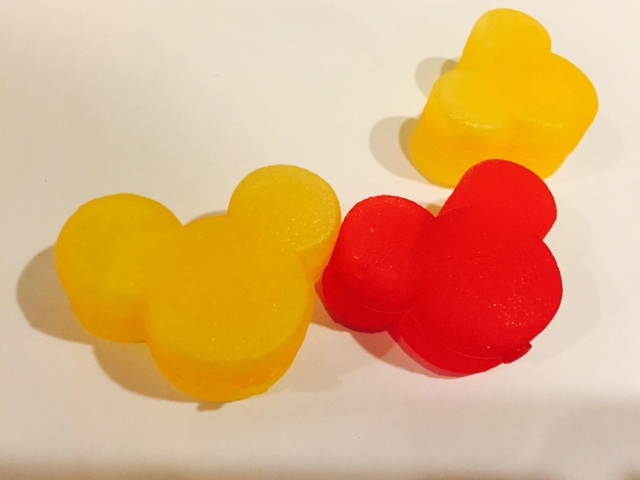 I wound up using the kids’ Mickey Mouse ice cubes, because guess what? If you turn them on their heads, they rest perfectly on the bridge of your nose. 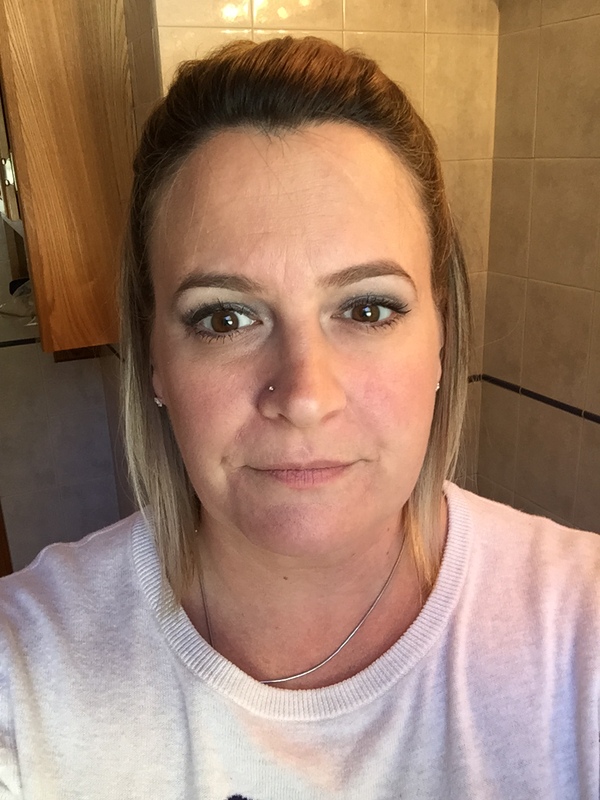 By Monday morning, the swelling had gone down and the slight bruising was easily covered with makeup, which was a relief, since I had to go get a new driver’s license. However, now it’s Wednesday night and my nose is still hurting. That’s probably normal after taking one to the schnoz, but I may go to the doc tomorrow just to have it checked out. I also think it looks a tiny bit crooked, but after reviewing old photos of myself, I wonder if my nose has always been slightly less than straight. That’s a crazy thing to notice after so many decades on the planet. This is from Monday afternoon. Is it leaning a bit, or has it always looked this way? 1. Parenting — even the calm stuff, like spooning — can be dangerous business. 2. Ice and ibuprofen are your friends. Always have them on hand. 3. When your child gives you his stuffed toy to sleep with, it really does make life a little bit better. What’s your worst parenting injury? This entry was posted on November 5, 2014 by Maisy Fernandez in Kids, Parenting and tagged broken nose, cuddling, painting, unintentional injury.